Our thanks to Don Church and Tony Schillaci – Critics on the Aisle – who posted this article about the Playhouse 2013 Season. Follow this link to read the whole article. 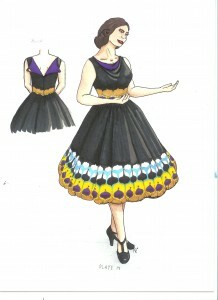 Our new costume designer, Kari Crowther, has been building fabulous new creations for Life Could Be A Dream. 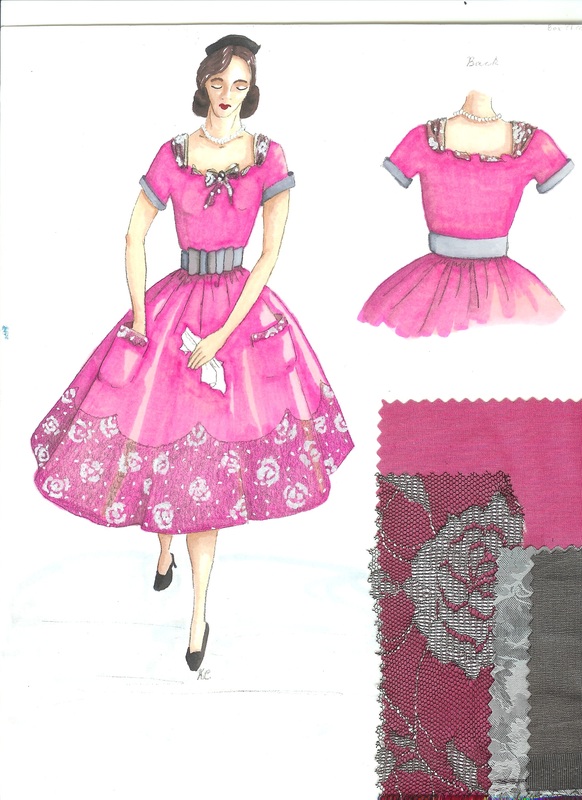 This dress, pink taffeta with lace overlay, will be seen in Act 2, Scene 1 where the character Lois is meant to appear feminine and fragile before the boys come to her rescue. Each garment is being designed and built by Kari. This dress, a beautiful black satin, will be worn before the radio contest and will compliment the bowling shirts worn by the boys in the show. Kari explains that this dress is a “transition” piece – a little less girly – worn at the time when Lois is changing from girl to woman. Thanks to Kari for sharing her hand drawn design sketches. Life Could Be A Dream – Playhouse Opens 2013 Season With Doo-Wop! Ivoryton: It’s been a long hard winter in Ivoryton. I think we are all tired shoveling and plowing and we are ready for spring and the first show of our 2013 season. And what better way to open our doors and welcome you back than with a trip down Memory Lane and the great classic doo-wop songs of the ‘50s and ‘60s. Sh-Boom! Take a trip to Springfield and meet the Crooning Crabcakes, as they prepare to enter the Big Whopper Radio contest and realize their dreams of making it to the big time! Trouble comes in the form of Lois, who arrives to put some polish on the boys. Denny and Wally fall in love, Eugene falls apart, and along comes handsome heartthrob Skip to send the whole situation spinning. The ’60s doo-wop songs say it all: “Fools Fall in Love,” “Tears on My Pillow,” “Runaround Sue,” “Earth Angel,” “Stay,” “Unchained Melody,” “Lonely Teardrops,” and “The Glory of Love.” Winner of the Los Angeles Drama Critics Circle Best Musical Award, Life Could Be a Dream will leave you laughing, singing, and cheering—let’s hear it for the boys! The cast features some exciting young talent – Evan Siegel*, Aaron Catano, Matt Densky* and Rob Rodems as the fabulous boy band – and we are thrilled to welcome back Sheila Coyle* who was such a hit in Ivoryton in last season’s Breaking Up Is Hard To Do. The show is directed by Jacqueline Hubbard, musical director is Jason Wetzel and choreographer is Schuyler Beeman. Set designed by Dan Nischan, lighting design by Marcus Abbott and costumes by Kari Crowther. Life Could Be A Dream opens in Ivoryton on March 13th and runs through March 30th . Performance times are Wednesday and Sunday matinees at 2pm. Evening performances are Wednesday and Thursday at 7:30pm, Friday and Saturday at 8pm. Tickets are $40 for adults, $35 for seniors, $20 for students and $15 for children and are available by calling the Playhouse box office at 860-767-7318 or by visiting our website at www.ivorytonplayhouse.org (Group rates are available by calling the box office for information.) The Playhouse is located at 103 Main Street in Ivoryton. Members of the press are welcome at any performance. Please call ahead for tickets. Follow this link to see the article.